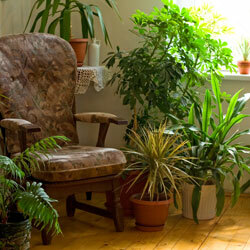 Houseplants transform a house into a home, purify the air, promote relaxation and improve concentration. The ficus group includes four popular small trees grown as houseplants, each looking very different from one another, and each incorporating these and other great benefits. Wonderful as gifts, smaller plants continue growing and reminding the recipient of the giver’s good wishes for many years. A larger specimen can anchor a room or office, fill an awkward space and set a sophisticated decorating tone. We sell both small and large sizes of these easy-to-grow plants. There are several types of ficus to choose from. Whether you are giving the plant as a gift or want to enhance your own home with more greenery, consider these different varieties to choose the ficus option that best suits your needs. Weeping Fig (Ficus benjimina): Your classic ficus variety, the weeping fig has green or variegated foliage with 2-4″ long, twisted and pointed leaves on twiggy, spindly branches. The tree has a graceful rounded and weeping appearance. Can reach 5-6′ tall, making it ideal for smaller spaces such as apartments or condominiums. Rubbertree (Ficus elastica decora): Emerging from bright red sheaths, the large, thick, oval variegated or green leaves of the rubbertree grow 10-12″ long and 6″ wide with a central rib of white on top and red on the underside. These can reach the ceiling in time, and this plant is often considered foolproof for its easy care. Because of the space needs, these plants are best for larger areas with abundant room. Fiddle Leaf Fig (Ficus F. lyrata): Similar in size to the rubbertree with a strong structural form, this fig’s leaves mimic the elegant, curving shape of a violin. The large leathery and textured leaves reach 12-18″ in length. This is another variety that will do best with more space so its form is well appreciated. Indian Laurel (Ficus retusa nitida): Growing to a 6′ tall weeper, dark green oval 2-4″ long leaves cover the drooping branches of this elegant small tree. New leaves provide light pink and bright green color contrasts to the older leaves. This is an ideal specimen for smaller spaces or anywhere a burst of natural color is appreciated. All of these ficus varieties are among the easiest to grow houseplants, whether you want to nurture them from smaller, younger plants or are interested in larger, more mature specimens. Stop on by and pick some wonderful ficus plants up for gifts or for yourself.